We’re bringing back dystopian thrillers with this tight, action-packed, adventurous read! 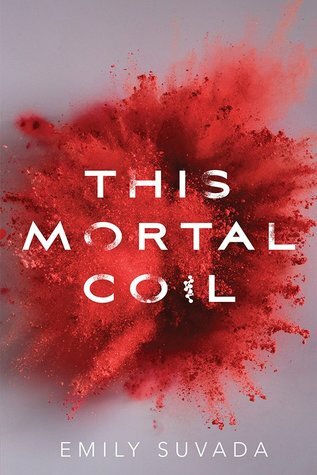 This Mortal Coil follows the first-person, present-tense POV of Catarina Agatta, a talented genetic hacker who can manipulate DNA the way coders manipulate data. The author takes a lot of the beginning to introduce the world (quite an info-dump that makes it drag a bit), and takes us on a road trip adventure to finding the cure of a contagious virus that’s ready to wipe out the human civilization. The science is super interesting in This Mortal Coil and Suvada does go rather in-depth. Nonetheless, the characters are constantly on the move through each twist (although I did find it a bit predictable since I’ve read so many similar dystopians). The basic premise of the book is that we’re in the future and humans are able to hack into their genes. Want to accelerate healing? Simple. Want to grow a third eye? Why not. Their only limitations are their imagination, and each person has a panel in their arm that controls the “apps” for their body. VR is always used, and sending messages is a thought away. However, Catarina has hypergenesis, which is an allergy to the nanites that run this genetic technology. Her body resists it, and trying to install a lot of apps could get her killed. Very special. There is an evil group, of course, called Cartaxus that’s a blend of military and corporation (but is apparently neither, as the book says) that wants to control the panels of humans. They withhold vaccinations for diseases on purpose and hegemonize people through “protection” in a place called Homestakes. While this is happening, the Hydra virus is out in the open that makes infected people’s cells explode. Like I said, lots of things happening in this story. Let’s review: special snowflake, check. Evil corporation-but-technically-not-a-corporation, check. Contagious virus, check. Sounds like a sci-fi dystopia! So Catarina’s father, Lachlan, is the leading DNA coder of the time and he gets forcefully taken by Cartaxus in the beginning of the book to create a vaccine for the Hydra virus. Catarina is living alone in the wild and barely surviving, until a Cartaxus soldier comes and tells her that her dad died, but he left clues of the vaccine for her to trace. Thus begins their journey for the clues to the cure. The soldier, Cole, has a mysterious link to Catarina and they both have to rely on each other for survival. It’s an interesting dynamic because Cole is genetically enhanced to protect her and has tons of survival instincts, while Catarina is strong in her own way – through her coding abilities. While this adventure is happening, Cole and Catarina are falling in love even though they have previous feelings for other people. Cole is looking for his lost ex-girlfriend, Jun Bei, who escaped Cartaxus, and Catarina has feelings for her father’s assistant, Dax. The love square is resolved easily and there’s really no competition on who the main ship is. Although I do have to complain about the romance, a bit. I’m okay with insta-love/attraction. But the way the author wrote it kind of grated – it was pretty quick, especially towards the end, and didn’t really have a basis. Other than a certain spoilery detail, there wasn’t a solid foundation that connected the characters emotionally, and because of that I wasn’t quite on board with it. “This isn’t just a crush. This is more. With a quote like that, I really wasn’t about the romance. Although Catarina was super smart, she was also susceptible to mistakes and I really appreciated that. Cole, Dax, and the other characters weren’t as explored and so I was never really into them. I think the copious amounts of scientific information and explanations, as well as the road trip, made less page time for characterization and relationship development. I did enjoy Lachlan’s manipulation even from the grave and his conflicting father-daughter relationship with Catarina though. On one hand, she’s devoted to her genius father. On the other, she can’t believe the evil things he’s done at Cartaxus. At its heart, This Mortal Coil explores what is right and what is wrong, as well as the gray areas in between. The science parts were quite stellar and I’m giving that five stars. I mean, a lot of thought has been put into it and you can really see the author’s passion through her words. The plot itself was three, romance was two, and Catarina gets four stars because I’m a fan of her strong character. This Mortal Coil is heavily reminiscent of the dystopian books that came out around the 2010’s. (I know, because I gobbled them up.) There’s plenty of action and adventure, and somewhat predictable twists that is a must for these science fictions. The first books that come to mind are The Darkest Minds by Alexandra Bracken, In the After by Demitria Lunetta, Burn Out by Kristi Helvig, Arclight by Josin L McQuien, Reboot by Amy Tintera… the list goes on and on. Out of all of them, This Mortal Coil definitely does science the best – the plot, on the other hand, follows similar tropes. I’m really up for that old scifi dystopian vibes but the sound of my romance kind of disappoints me. I’ve been eyeing this one for quite some time now. So I’ll still try it at some point but definitely not anytime soon. Great review! Thanks so much Czai! Ooh, if you like the oldie but goodie dystopian vibes, this series will definitely be up your alley! I think I’ll pick up the sequel if it’s ever available at my library! For now, it’s not a priority. It was a fun enough story, but there are wayyy too many books on my TBR to follow up immediately. 😛 So glad you liked it! Great honest review, Aila! I actually loved this book but I also agree with some of your points. I also didn’t like how the romance was rushed at the ending and yeah, the twists were predictable for me too. I loved the science in this book. It’s one of the best aspect. Really happy you enjoyed this one Raven 😀 I admit, I’ve become a bit more harsh on my scifi reads lately hehe. But the science in this one was still super fun!